Sam loves fishing that’s for sure and he is looking forward to the next day when he and his dad will take the boat to the lake for the day. He is over the top excited. They have collected their bait. The tackle box is prepared. And then… and then… little sister, Lucy comes. Loud and squirmy, crackly and slurpy Lucy fills the boat. Worse yet, she seems to have the lucky pole! From sleepless excitement to rockbottom dispare to appreciative acceptance Gone Fishing shares Sam’s hopes and dreams about fishing through a collection of poems in a trio of voices. Dad and I hunt worms tonight. 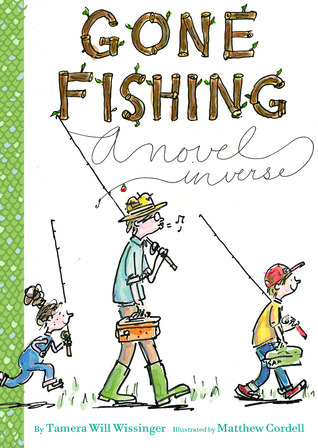 This is a book for those who love fishing. This is a book for those who know how hard it can sometimes be to share what you’ve been dreaming about with others. This is a book for those who care about poetry. A complete story told through forty-one different poems – each one a different type. What fun! “The Poet’s Tackle Box” at the end of the book offers advice and information to interested poets. You may be surprised to learn how similar writing poetry and fishing are. Enjoy Gone Fishing. What’s your favorite? Ogden Nash was born 110 years and nine days ago, on August 19, 1902. He was a very well known American poet, famous for his humorous poetry and uplifting verses. He lived 68 years, dying in 1971. During his 68 years, he published 14 volumes of poetry and wrote more than 500 pieces of comic verse. He has a house in North Hampton, NH by the beach, and was buried in that town as well. The house has a plaque dedicating him to it. Ogden Nash’s poems will always be fun to read. Robert Frost was born on March 26, 1874. He is VERY well known for his poems about nature, New Hampshire, New England and how inspirational and thought-provoking his poems are. He lived in a lot of places in his 88 years, but he lived in Derry, New Hampshire in a farmhouse for the majority of his life. Now it is owned by the state and you can now tour it for a very little fee. I did it once, because I studied him in fourth grade, and it was very interesting. I saw the kitchen that the Frost family ate most of their meals in and sat in the chair that Robert Frost sat in almost every day, reading the paper. It is a good experience to have, since Robert Frost will always be one of the best known poets in America. One of his most famous poems is called, “The Road Not Taken,” and it is deeply inspirational. Click here to hear Robert Frost read to you, “The Road Not Taken”. Shel Silverstein was a lot of things. An American poet for sure, but he was also a singer-songwriter, cartoonist, musician, screenwriter, composer and author of children’s books. His black and white cartoon style of drawing always intrigued me and the story/poem that went along with it was always great as his poetry makes you think about things that don’t exist, but the problems that they have very much exist. My favorite one of his works is entitled The Missing Piece and it is about a ball/circle, looking for it’s missing piece that is shaped like a wedge. He has so many speacial accomplishments. Shel Silverstein died on May 8, 1999, aged 68. Eve Merriam - Author of "The Singing Green"
from the poem “Summer Rain”, you can almost feel the salt on your nose and you can almost see the stars on your toes. It is a great feeling to connect with poetry in such a deep way! When you read the poems that you can connect to, you think about the subject of the poem more and you realize things you didn’t realize. For a school project, I had to complete a poetry anthology with a theme (mine was nature) with poems written by me and other authors. I chose two of these poems and I think that they are the best two in the whole collection because of the (again) creativity and description. I am not usually a huge poetry fan, but when I came across this poem book, I formed a new opinion too. Even if you do like poetry, I think you will too! Click here for a quick bio of Eve Merriam from Poets.org. Sorry for the lack of an image of the book. It’s very old! A month or so ago a friend asked us if we were going to review any poetry books… we hadn’t, but we thought we should. We share poetry in our classroom every day – we read them mostly from chart paper and not from the books themselves. Why I wondered? And so that changed. We shared lots of poems about reading from Good Books, Good Times! and I am the Book both with poems selected by Lee Bennett Hopkins. And then we found Bookspeak! 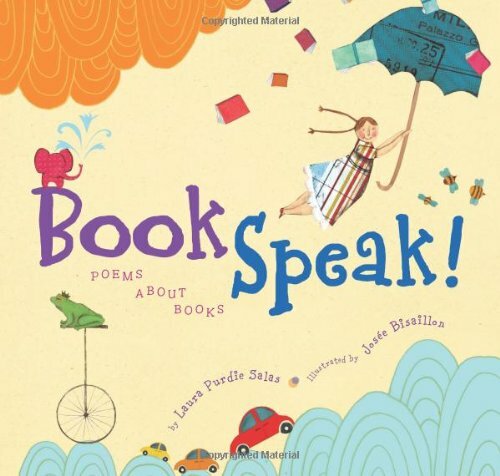 : Poems about Books by Larua Purdie Salas and illustrated by Josee Bisaillon. The opening poem gives you an idea of the wonderful poems to follow. There are poems about the table of contents and an index. There are poems in voices and poems sharing thoughts about story elements. We have had fun sharing them with each other in our classroom. I think you will too – make sure to enjoy that amazing illustrations, or you might want to come up with your own that show how books speak to you. We got a great comment from someone who said they would like us to post books about poetry. But none come too mind so instead we’re going to have to post poetry about books. Enjoy!